Back in the old days, there were no such things as USB flash drives, portable hard drives and WiFi. To transfer data from one computer to another, you had to load your data onto floppy disks. Many people have fond memories loading basic programs, documents and scanning photos onto these disks to bring to class or to a friend or family members house. Many times we may have long lost data on these disks that would be cool to see again. The first thing to notice about your disks is the size. 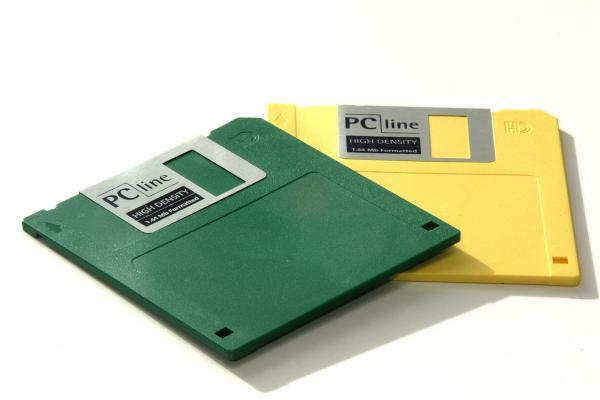 Floppy disks came in different shapes and sizes, and eventually fell on the standard 3.5in floppy we’ve all seen. The floppy disk drive (FDD) was invented at IBM by Alan Shugart in 1967. The first models of floppy drives used an 8-inch disk, which was actually floppy, and not rigid like later models. The 8-inch floppy soon evolved into the 5.25-inch disk that was used on the first IBM Personal Computer in August 1981. the 5.25-inch disk held only 360 kilobytes compared to the 1.44 megabyte capacity of the 3.5-inch diskette. Most likely, you’re going to find you have the 3.5in variety. Computers these days rarely come with a floppy drive anymore, as it’s essentially been replaced by the USB flash drives and memory cards. If you still have a computer with a floppy drive, then you’re in business, just pop your disks in there and drag and drop your old files onto your computer. If you don’t have a computer with a floppy drive still available, then the only way to get the data off of your disks is to either purchase a USB floppy drive, or take it through our data extraction services. Keep in mind that these disks hold about 1.4MB of data, and has extremely low transfer speeds compared to what you’re used to. I am not familiar with any company in the Bay Area, but our southern California stores are all equipped with the necessary tools to extract your data. If interested, please give us a call or email through our contact page!